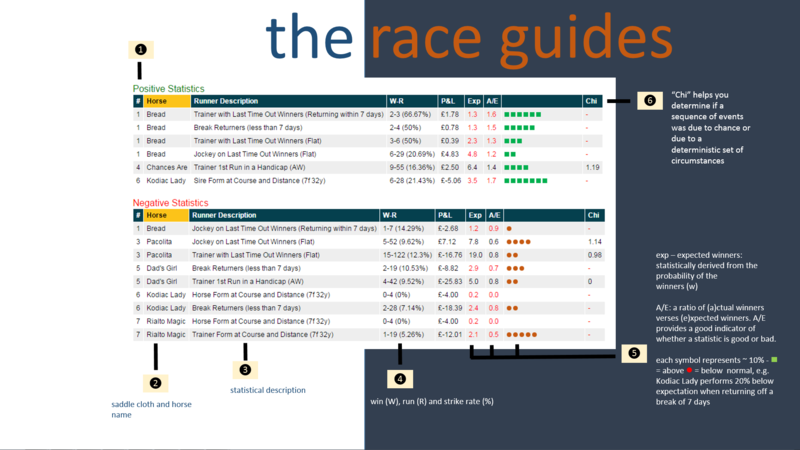 Using the power of Proform, we have developed the Proform Race Guide which breaks the mould to provide relevant race information for the casual and serious punter. Proform Power Ratings. On average the winner is found in the top 3 power rated horse 60% of the time! Identification of well handicapped horses. Identification of horses with faster than class speed ratings. Utilisation of sophisticated statistical techniques presented in a graphical form for ease of interpretation. 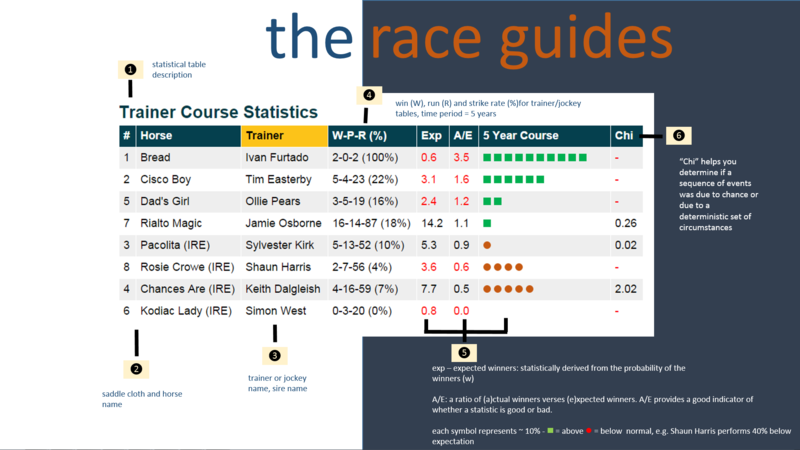 Summarised Trainer/Jockey course statistics and trends in easy to read tables. 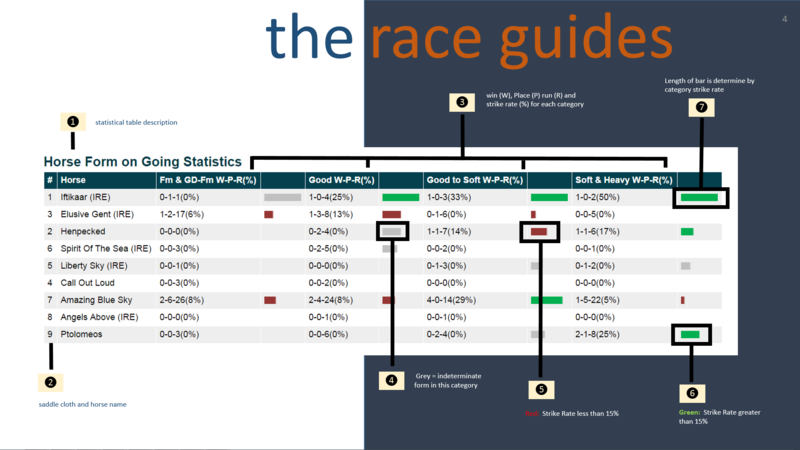 Draw Bias and Pace Map for all the runners so you can anticipate how the race could be run. Distance and Going preferences for horses and sires. Plus much much more and you won’t find this type of information anywhere else! Using the Proform Power Ratings, note the higher rated and closely rated horses. Using the horses form string determine which horses perform well given the conditions of today’s race. Make a note of horses that are dropping in class, who ran a speed rating faster than class in their last race and those that are well handicapped. 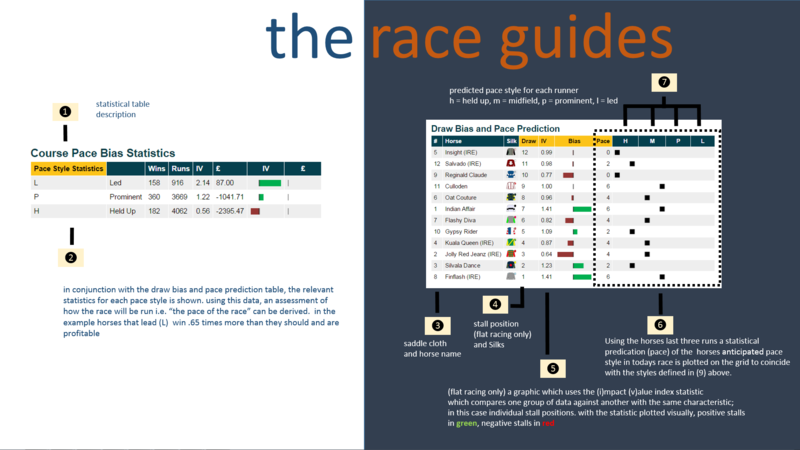 Allowing for the draw bias, visualise the running of the race. Determine which horses are suited to the draw/pace conditions. Review horse's stable form and jockey form to determine if either are suffering from below par performances. Think chances! 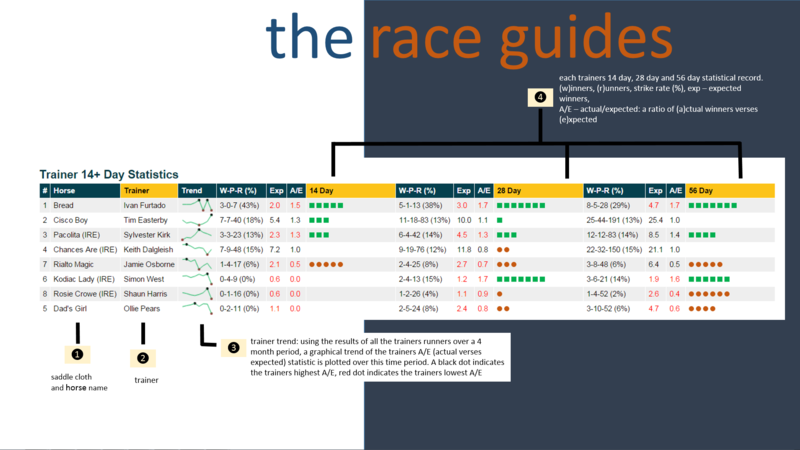 From the list of your contenders and using the Proform Race Guide betting forecast, determine which horses are underestimated in the market based on your assessment of the race. 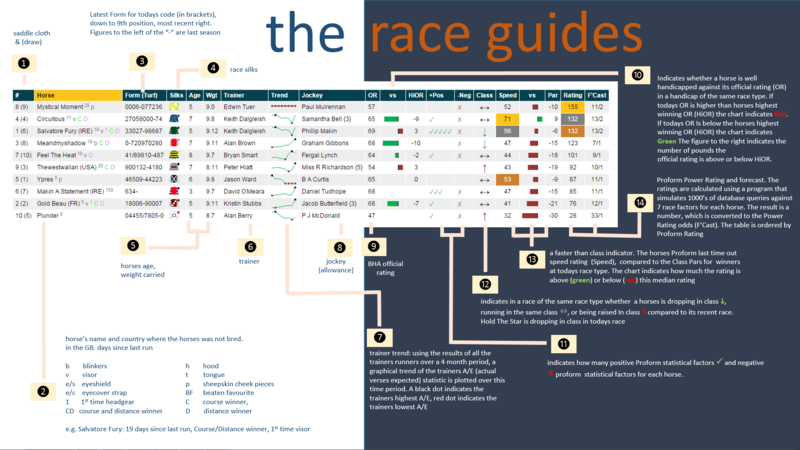 Use the race guide to augment your own handicapping factors, systems or process. 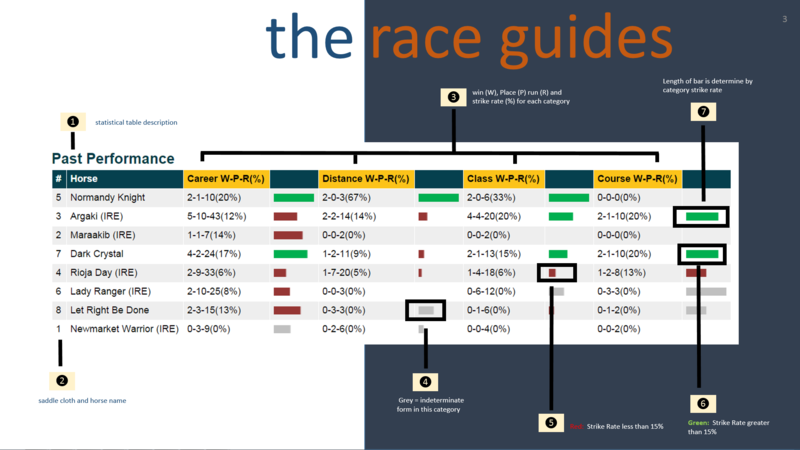 In the Race Guide, for every race we make it easy for you to identify our top three Power and Speed rated horses. Ratings of various types appear in all sorts of publications and are typically based on the official BHA rating scale. This method is merely unravelling the handicapper's work. Using sophisticated statistical methods, the Proform Power ratings are different in that they are calculated using software that simulates 1000’s of database queries against 7 race factors for each horse in the race. On average the winner is found in the top 3 Power Rated horse 60% of the time so the rating alone can go a long way to narrowing the field! Speed ratings are a measure of a horses capabilities against the clock. The horses last time out speed rating is scaled from 0-100 and is non weight adjusted. The average punter ignores race times and, given the choice between a previous impressive winner and one that has won in a particularly fast time they invariably support the impressive runner. That’s why we provide each horse’s last time out speed rating in our race guides. 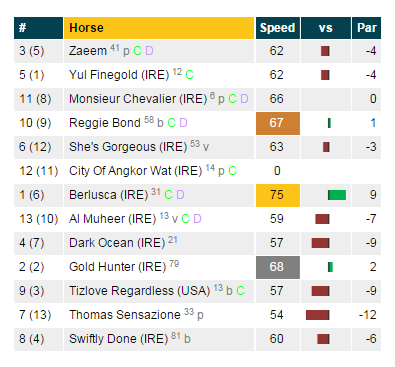 As indicated in the image above the “speed” column is the horse’s last time out Proform Speed Rating. This number is compared to the class par for winners at today’s race type. BERLUSCA speed rating last time out was 75, 9 above the median speed rating for this class. AL MUHEER Speed rating last time out was 59, 7 below the median speed rating for this class. Is the Horse Well Handicapped? 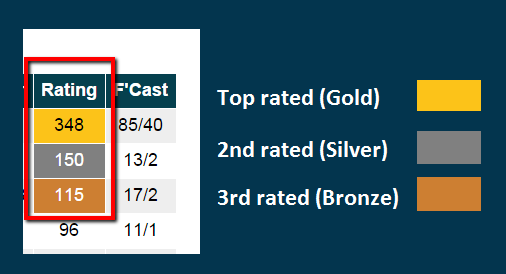 The example image above from our Race Guide above indicates whether a horse is well handicapped against its official rating (OR) in a handicap of the same race type. If today’s OR is higher than horses highest winning OR (HiOR) the chart indicates Red. If today’s OR Is below the horses highest winning OR (HiOR) the chart indicates Green. 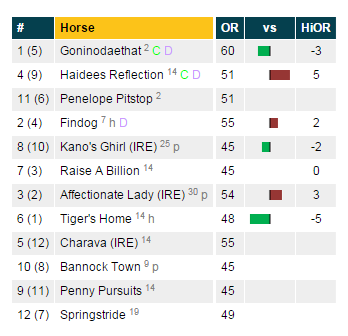 GONINODAETHAT is running off an OR of 60, 3 lbs below its highest winning handicap rating. The past performance grid summarizes each horses record based on Win/Run percentage strike rate under each category. Watch this video to learn more about information in this table. Each column represents the horse’s performance on different goings logically grouped together with the official going for today’s race highlighted in yellow. The positive or negative pointers refer to primary (i.e. course, distance, going) and secondary factors (i.e. sire/trainer/jockey) identified by Proform in every race. Using our positive and negative indicators you can factor our data into your decision making process. The table above the course record of the trainer in the last 5 years. The table layout is used throughout race guide to also display stats for Jockey, Trainer and Jockey combination form and Sire related statistics. The key statistic used in the race card is actual verses expected, commonly known as the A/E index. The A/E index simply put, is a statistical measure of goodness for a particular group of data. 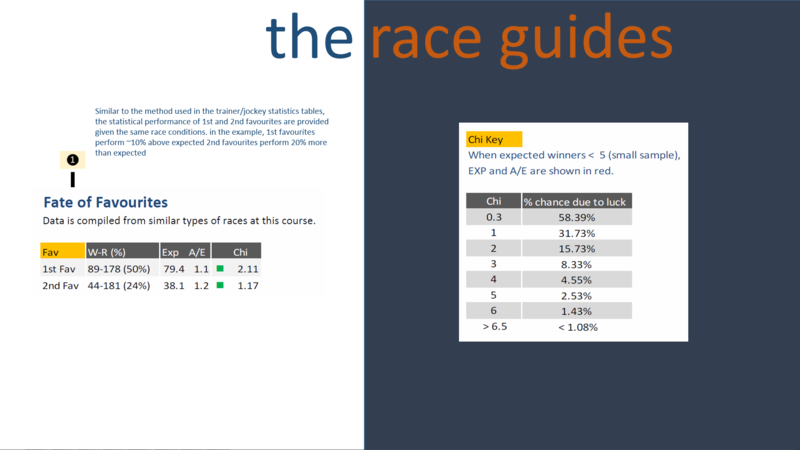 Within the race guides we use the A/E index in a number of areas to benchmark actual wins verses expected wins e.g. trainer course form. This table can be used to identify the form of the trainer over a period of 14 days, 28 days and 56 days. Pace mapping tires to visualise the pace within the race. In conjunction with any draw bias, pace/draw analysis form a powerful weapon in the handicappers armoury! The image above details the pace statistics for the course and distance in question. From the data the “course pace bias” can be determined i.e. does the course favour horses that like to lead? Fate of Favourites and is a Stat Due to Luck? The remaining two tables in the race guide contain information on how favourites and second favourite perform in the race of the same type and the “Chi” table is that it helps you determine if a sequence of events was due to chance or due to a deterministic set of circumstances. Click on this link to learn more about Chi and how to use it in your selection process.